In the past, the FS industry acknowledged that the majority of attacks - up to 95%, by some accounts - were either internal or enabled by human error. Therefore, improved education and learning for users and employees has been (and remains) a high priority. However, within the last couple of years, there has been a shift of focus within the industry from internal to external threats. Indeed, across all sectors, Financial Services has been ranked as one of, if not the most affected. Typically, attackers focus on servers as a point of ingress to obtain confidential data and user credentials. This doesn't necessarily mean an organisation's own servers, and one should not assume that all external breaches are direct; IT and security teams now face further challenges with regards to the management and risk of third party systems, which to many cyber-attackers are seen as an easy ‘backdoor’ into organisations’ infrastructures. Third party vulnerabilities have led to some of the industry's major breaches, and whilst vendors should of course be concerned and responsible over their own security, it is their clients that face the largest penalties and negative publicity. The industry has witnessed a magnitude of threats over time, but over the last couple of years the landscape has remained relatively unchanged. Bad actors will continue to look at innovative ways to breach data (such as bots and automated scripts); however, it is the simplest attacks that remain the most effective, and require the least amount of effort. The highest rising threats include Web Applications Attacks, DDoS, Botnets, and Data Breaches. A successful attack can result in outages and downtime, disruption and distractions to IT and security team alike, poor business and operational performance, significant impact to P&L, and severe brand damage. Now, with GDPR regulations firmly in place - there are also major fines to think about (up to €20m or 4% of turnover). Furthermore, these fines are liable to grow exponentially, as each and every individual customer can be encouraged to take legal action for leakage of data and potential identity theft. While GDPR is the current buzzword, there is an incredibly complex, lengthy list of other legislations, frameworks, directives and procedures one should or has to adhere to, both for compliance and to gain a competitive advantage. One newer directive is PSD2, the second Payment Services Directive which is set to regulate new forms of payment and interaction models, and mandate the opening of banks' APIs to third parties. Last but not least amongst the many challenges facing the industry, is the gap that many senior stakeholders admit exists between their wider business and its security function. This gap leads to a lack of understanding on the part of the business of the importance of security, and in turn to low security budgets - weakening the promotional power of the security function. This vicious circle acts as a significant obstacle to achieving cyber security excellence. As a result, Financial Services are continually looking to implement: proactive ways to manage and monitor cyber activity; strategies for outsourcing, hiring and retaining talent and commissioning experts to review, audit, report and score their security posture and close the security and business divide. 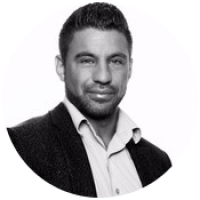 Martin has 11 years’ consulting experience across the mid-market and enterprise space, helping organisations harness the power of people, relationships and technology to achieve outstanding business outcomes. Having worked within Fortune 20 and small agency environments, Martin has supported companies on a number of varying projects, such as outsourcing, adopting and integrating Next Gen Software, Cloud and Cyber Security solutions by keeping ahead of the latest trends and innovations. With a track record in strategic thinking, Martin is able to provoke thought, drive value and change to ongoing and transformation projects. Martin’s focus is to support Exponential-e’s Financial Services customers throughout their Digital Transformation journey, to connect industry leaders with like-minded subject matter experts and to create meaningful relationships that enable business and revenue growth.